Good morning. 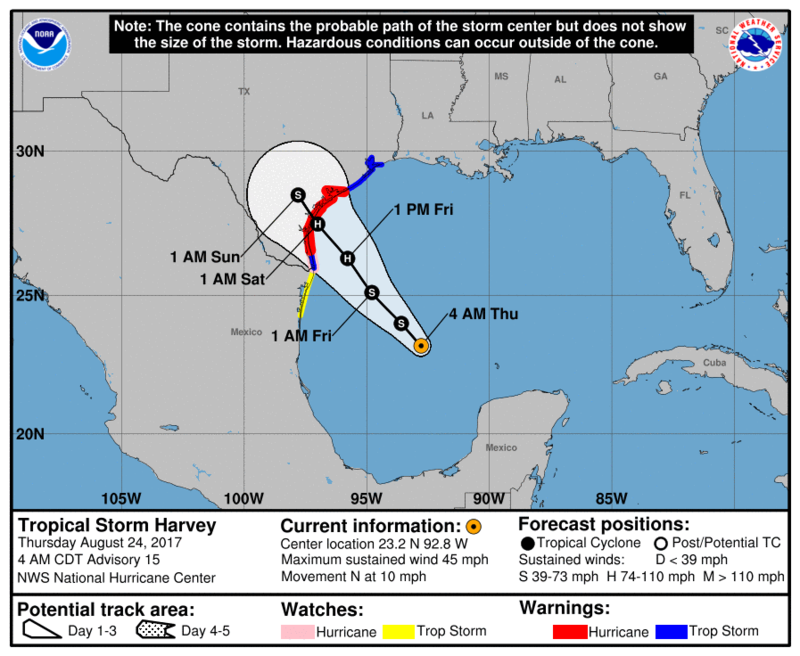 Tropical Storm Harvey has shown signs of better organization overnight, and now appears likely to become a Category 1 hurricane before landfall. However, given the warmth of the Gulf of Mexico and lowering wind shear levels, a stronger storm seems possible. As discussed Wednesday, models are increasingly focused on a landfall between Brownsville and Corpus Christi, and the National Hurricane Center has issued hurricane warnings for locations from Port Mansfield to Matagorda, Texas. This much of the forecast seems clear enough. Over the next two days, before Harvey makes landfall late on Friday or early Saturday, the storm will bring heavy rainfall, storm surge, and possible hurricane conditions to portions of the lower Texas coast. Through Saturday, some areas from South Padre Island through to Matagorda Bay, may receive a dozen inches of rain, or more. Barring a major change in forecast, locations further up the Texas coast, including Houston, will see seas rise 3 to 5 feet above normal levels, gusty winds, and perhaps 2 to 4 inches of rain through Saturday. The key question for the upper Texas coast, including the Houston region, is what comes next. As we’ve written about here for a couple of days, Harvey’s steering currents fall off once the storm moves inland, into southern Texas. For example, here’s how this morning’s ensemble GFS model predicts the location of Harvey’s center on Friday evening. Note the tight clustering of 50 different model runs—that means there is pretty high confidence in the solution as the storm nears the coast. However, when we fast forward to Tuesday morning, as depicted in the graphic below, and can see a broad spread in the model solutions for the center’s location. This uncertainty, also seen in the European model, reflects the challenging nature of the forecast for Texas and Houston early next week. Note that this forecast is for Harvey’s location three days after landfall, after the storm has moved inland, and the center has wobbled around. 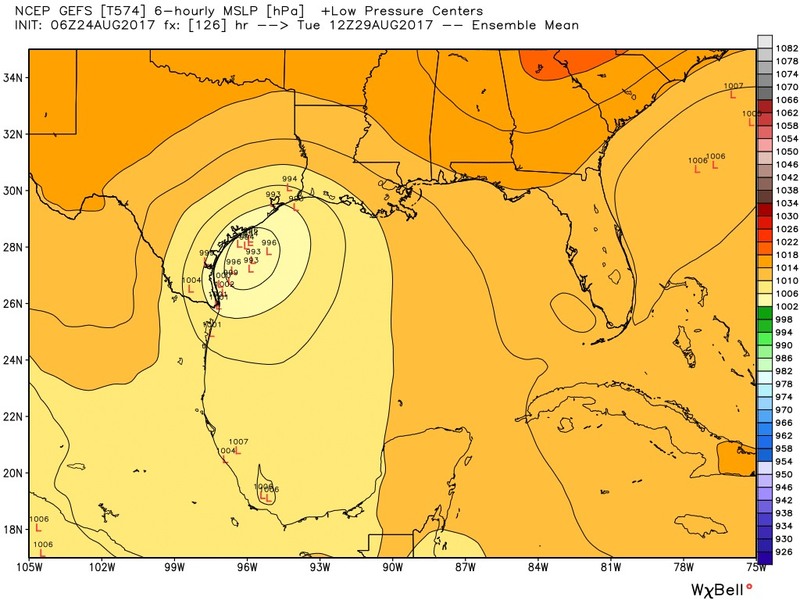 By Tuesday morning, about one quarter of the models have dragged the low into south Texas, the majority have brought the center back to the coast near Corpus Christi, or offshore. The remainder have brought the center up to Galveston and Houston. There are lots of possibilities for what will happen, obviously, but I think there are two distinct scenarios that will impact Houston’s weather. Since we are talking about weather events three to six days from now, there is already some uncertainty, but the erratic motion of Harvey, post-landfall, only adds to that. This seems like the most likely scenario (75 percent), in which Harvey loops around the Rio Grande Valley and then gets pulled to the northeast, either moving back over the Gulf of Mexico (and toward Louisiana), or up the Highway 59 corridor through Houston. In either case the Houston metro region is going to get drenched. Under the Highway 59 track the entire region gets a lot of rain, probably 10 to 20 inches (with higher isolated amounts), and under the Gulf scenario the rains are much higher in the southern half of region, perhaps around Interstate 10 and points south. In this case, the heavy rains would probably not begin before late Saturday night or Sunday morning and persist, on and off, through Wednesday. The official rain accumulation forecast from the National Hurricane Center reflects Highway 59/Gulf of Mexico scenario. There is a lesser chance for this scenario (25 percent), but it seems plausible to me, and some of you have asked me about a “best case scenario.” This is a relatively good one for Houston, but a terrible one for South Texas, which picks up 20 inches of rain (plus or minus) and sees widespread flooding. In this scenario, some of the ensemble members show the center of the storm dragged inland long enough that it burns itself out before ever getting pulled northeast, toward Texas and Louisiana. Under this scenario, the Houston region would be largely “spared,” with perhaps 5 to 10 inches of rain spread over several days. This will not have immediate drastic effects for Houston, and while intermittent heavy storms and gusty winds are possible through Saturday, conditions for travel seem OK at this time. By Sunday, running through about Wednesday, the greater Houston region will be at risk for very heavy rainfall and potentially widespread flooding, and coastal regions may be most at risk. If you are traveling later on Sunday or early next week, your flights may be delayed or canceled. The forecast for next week remains highly speculative for Texas, but ranges from bad to very, very bad in terms of flooding potential. The time to prepare is now. Here are some tips for dealing with inland flooding. Under scenario #2, how much rain for the Beaumont-Orange area? Manageable amounts, probably about 5″. 1. According to the forecast path above, landfall is now between Corpus Christi and Brownsville, right? 2. You had said gusts around 40mph seem like a reasonable worst case scenario for Houston. Do you now believe these will be higher? 3. Is the risk for power outages greater in Corpus Christi than in Houston, even if Harvey strengthens to Cat. 2? 4. WILL it be a Cat 2 @ landfall? Thank you for updates. After I read a newcast this morning, I still felt in the dark. Your update brings as much clarity as possible to an ever changing situation. Eric – do you think I will be fine flying to Mexico City from IAH on Friday at 6pm or better to fly this evening? We will be flying out of IAH on Friday for Mexico City around the same time, do you think we’ll still be fine after the latest update on the storm? At this stage, (and I don’t want to be apocalyptic, but I do want to emphasize the seriousness) do you agree that this has a reasonably high potential to be the worst widespread flooding event (not more isolated to certain sections of the city) in Houston’s history? Thank you for not getting caught in the hysteria. Objectivity is key. This is why I love you, Eric. You are not at all sensationalistic, and you cut to the chase. Thanks for your clear, concise forecasts and for not feeding in to the frenzy. What about the winds in Houston? Harvey is now expected to be Cat. 2. Will winds be at hurricane strength (100+) in Houston as they will in Corpus? Tropical Storm Allison must be laughing in her grave over that question. Thank you very much for your thoughtful reporting. I’m a “charter” reader and have always enjoyed and appreciated your research and well-written information. Especially useful in a run-up situation like we have with Harvey. Great work! Thanks for the update! I am flying into Hobby on Sunday, arriving around 9 – 9 :30 am. I am concerned about the drive from Hobby to my house (near the heights). Based on the scenarios provided, do you think the streets will already be flooded? Thank you! Eric, when do you think the models will have a better handle on which scenario will happen? Later today, tomorrow, or will we literally not know until Saturday afternoon or so? I have a flight landing at HOU at 5pm Saturday. What are the chances that flight is cancelled as a reault of the storm? Eric: What are your thoughts on flight delays vs. cancellations flying into Hobby on Monday? I realize we can only speculate at this point, but as I need to get back Monday, I’m wondering if flying into a nearby airport and driving home to Houston would be a better option to avoid an outright cancellation. Thanks as always for your response and hype-free forecast. I appreciate the non-emotional and straightforward reporting. That’s why I refuse to turn on the television for updates. Thank you for the update. I am flying into Hobby on Sunday around 9 – 9:30am. I am concerned about my drive home. How bad do you think the streets will be Sunday morning? I live around the heights. Potentially bad, but if your flight isn’t canceled you’ll probably be able to make it to the airport. If scenario 1 happens, would you guess that the flooding will be comparable to 2015 memorial day, or do you think it has the potential to be worse? Worse, because it would be much more widespread. I’m in Northwest Cameron county, the corner where Cameron, Hidalgo, and Willacy counties meet. What is the wind/rain forecast under Scenario 1&2? Potentially bad, but if your flight lands I think you’ll be OK driving home. I live near Spring Branch. Will I have time to wait until Friday afternoon to clean my gutters and French drains or should I do it Thursday night? Yes you can wait IMO. Thank you so much, Eric. I appreciate these forecasts more than you can imagine! I need to take a quick trip to Wichita Falls and back on Friday, and you’ve given me sufficient confidence that I’ll be able to return before the worst has arrived. Thank you! Eric I live in Corpus Christi, what wind speed and rain should we expect?? I’ll post at 10:30am about this. Thanks always for your good advice. Great information… No hype like the talking heads on TV. We’re scheduled to fly back to IAH from Montrose CO on Monday (small regional jet) and thinking we should come home early. And if so, how much earlier. We want to be home for it , not away worrying as our area does get street flooding. Should we fly back Saturday? Or Friday ? Or even today ? 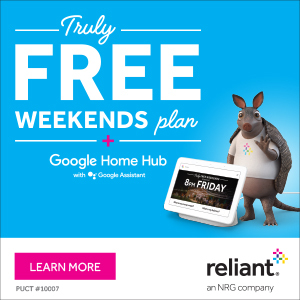 I am worried about my elderly mother who lives alone in the Southwest Houston area. Her house has flooded several times already & although she has talked about leaving (& been encouraged) she has yet to do so. What would you suggest in preparation for this storm? (Sandbags/water/etc) I’m already expecting her house to flood. She is not capable of lifting heavy objects. Worried about her right now, but I live in another state many hours away. I think you have a right to be worried. You probably get tired of reading this, but this is the only place I count on for severe weather news without the drama. The local news has given no clarity whatsoever this morning – which is not at all surprising. Interviewing people gassing up their cars doesn’t really count as “news” to me. Keep up the great work, Eric (and Matt)! I tried to ask this last night, but can’t find it. So forgive me if it posted twice. I have family that just moved to Corpus Christi and is new to all this weather. I feel adequately prepared up here but am not sure what to advise them to do. Any suggestions based on what you’ve researched? I will address this in an update posted at approximately 10:30am. Thank you! I look forward to it and appreciate all the time you have invested in this cause. It seems like it is tracking more NNW versus the NW track that the modules suggest it will/might do. What will be driving it towards that NW track towards Corpus? Sharing this blog with my high school students today, so they can be a voice of reason compared to the sensationalism of local media. Eric, Thanks for your work here. What do you see for rainfall amounts in the Todd Mission area (Renaissance Fest area)? Hello, thanks for the great information. I am from Houston living out of state now, I have flights booked to visit this Saturday to Tuesday. If you were me and the Saturday morning flight were not cancelled would you still board? Maybe, but I’m not sure Sunday morning will be any better than Sunday night. Uh, what happens when Harvey, still a tropical storm, re-enters the Gulf of Mexico? I live in the Clear Lake City area – and I’m primarily concerned with flooding. Not outright from Harvey’s landfall, but later in the weekend. Under scenario #1 – which you mentioned is more heavily favored at this time by the computer models – do you foresee any significant strengthening of Harvey either into a strong tropical storm or worse? That is if it does indeed return to sea, and trek eastward? 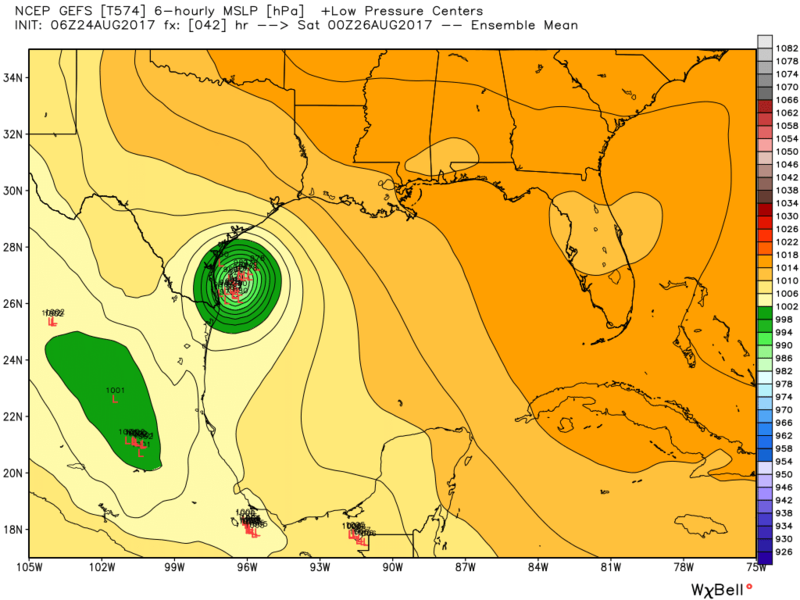 If it does get back over the Gulf, it certainly could regain TS strength. It probably does reduce your risk to come in Saturday. First off, great site, informative, strait to the point, and no hype! Do you think that we will have to board up our windows here in the Houston area. Unless there are drastic changes to the forecast, which we would certainly cover, the answer is no as long as you live this side of Matagorda. Do you have an idea of when we’ll know which scenario we’ll dealing with? Scenario 1 is far and away the most likely. I currently have an international flight landing at IAH at 1:50pm on Saturday – sounds like it will be raining, but do what % chance do you think IAH will have significant delays or cancellations by then? I’m an Okie with plans to travel, by car, to Houston Friday and returning back to OK Sunday. Would you advise us not to make the trip to Houston? Great website, I wish more OK meteorologist took your no hype approach when it comes to OK’s server weather. I’d make the trip if you’re willing to come back Saturday, should the weather turn bad. The latest forecast track at NHC shows the center of the storm appearing to sit in place from Sunday morning into Monday, somewhere north of Corpus. Is this a likely scenario, or just an indicator of how uncertain the track is after landfall? What does it look like for the Humble/Kingwood area? Hi Eric, thank you for the updates. We are new to Pearland, Beltway @ 288 and nervous. Any clue what to expect here for rainfall? No, sorry. Best guess is 10-20 inches. What is the predicted storm surge for the Galveston/Clear Lake area? Right now, a few feet. That could change if the hurricane strengthens. We live in San Leon. Any idea on when we might see surge begin? What percentage of hurricanes approaching Houston turn clockwise vs counter clockwise? what influences the direction? Is there a significant difference in impact depending on the direction? which way did Allison turn? The earth’s rotation influences the rotation – all northern hemisphere storms turn counter-clockwise. What about a little further north, like Kingwood area? Hi! It may be too early to predict, but I’m supposed to fly out of Houston to Boston on Wednesday morning… Should I look into flying out of another city? Or do you think it will be past us be then? Hard to say for sure, but I’d be looking at other options. Any ideas how the Spring/Woodlands will be affected? Great site! My go to for real weather advice and non-hype. Love it. Thanks for your efforts. I’m at the south corner of Westheimer and Kirby, how many inches do you think will fall in that exact spot? Also i have brunch plans on Sunday in Rice village, do you think it will be raining there at 11:50 AM on Sunday? My mom was planning to come into town tomorrow morning to help me with my kids during the storm since my husband will be working OT for most of it. We live in sienna plantation in Missouri City. If she comes do you think she would able to leave on sunday or should she plan to stay for a while? I will be flying from DC to IAH on Sunday at 7:30 p.m. Is it worth canceling the flight or do the heavy rains mainly start after Sunday? Just really wanted to emphasize again that I go nowhere other than NOAA and this site for weather coverage. We have tickets to Steven Tyler at Winstar Friday night. Had planned to head back to Houston Sunday morning. Looks like things may cooperate a bit to let us attend, but when do we need to head home Saturday afternoon or do you think Sunday AM travel will still be okay? I think you should definitely have that as a contingency plan. I’m curious, and trying to understand why the 75% chance is that it comes thru Houston. The chart showing the various model predicts on Tuesday has a majority of models predicting still in the far south area. It seems like the more likely option is that it could stay well south of us based on that. Why isn’t “dying in the rio” a more likely outcome? 75 percent represents chance that the remnants of Harvey get pulled over or close enough to Houston to drench it. We live in Webster in Egret Bay Blvd. What is your estimate of us getting flooding and what about winds? What direction will the winds be in scenario #1? Thanks a million for your information. We have a vacation planned for September 20-25 in South Padre. How does the forecast currently look for SPI? No widespread destruction down that way? Just making sure we’ll still be good by then. Thanks for all the info. We have prepared for this storm here in Freeport, but what should we really be doing? I ask this cause I’m a new homeowner with a 2 month old in the house. If the storm moves north toward Matagorda, you might consider boarding up your windows. But on the current track your probably OK not boarding up. Thanks for the info! We have a very important flight out off IAH at noon on Saturday and I’m a complete ball of stress. Are we looking okay or should we look into alternative plans? Unless you can go today or Friday morning, best to stick with Saturday afternoon. Still iffy though. Do you think all this will pass before the Texans – Cowgirl game on Thursday night??? Tailgating forecast?? Worst will definitely be over by then. If Houston is flooded really badly I could see them moving the game. By Thursday night it should be pretty nice out. Weather Channel and Beaumont news stations are pushing this storm may grow to a Category 3. Fear mongering or has something changed in the last few hours? Sorry for a question that applies to me alone, but I’m planning to travel to Fredericksburg Friday morning and return Sunday morning. Have a house booked for 17 people. We are trying to decide if we should cancel the trip. Freds will be fine, it’s the coming back we worry about. Do you think coming back Sunday morning is safe enough from what you know right now? Thanks for your updates, they’re great. I *think* you’ll be OK traveling back. But it’s a bit of a risk. Do you have an idea of what to expect in San Marcos this weekend and which day would be better to travel from Houston to San Marcos? I would advise driving there on Saturday afternoon-ish. Don’t think conditions in San Marcos will be overly bad, but you can expect some rain. I’m seeing that it’s strengthening to a Cat 2 and possible Cat 3. What are your thoughts? Is it just media hype? Not media hype. It’s the official forecast from the National Hurricane Center. They don’t hype. I am astounded at all the travel advice that you are asked for! I don’t think you should feel obligated to play travel agent for all these folks. The short answer is that hurricanes are unpredictable, so the best advice is to be prepared for delays. That’s how it goes when Houston gets severe weather – flights are canceled, streets are flooded, and traffic is awful because people don’t stay where they are and think they can drive through high water. Will the rains in the Rosenberg area, Ft. Bend County cause the Brazos to flood like 2016 flood? Or would they’re have to be lots of rain upstream, further up the Brazos, for that to occur? Any idea how bad things will be in the Austin area? I have a flight for my SO coming into IAH Friday and going back out of IAH Sunday night. From what it sounds like the Sunday night flight is probably going to be delayed massively or cancelled… United isn’t letting me cancel and refund the trip right now because they say it’s too early to know how the storm will affect air travel through IAH (basically they’re telling her to come first and get stranded given what we expect about the storm). She needs to be back at work Monday morning so we don’t want to risk coming and getting stuck for and extra day or few but United did offer to reroute through another airport. I’m supposed to fly into IAH from Minneapolis on Monday afternoon. I have a hotel on Crawford next to Minute Maid because I’m going to a bunch of Astros games all next week. Do you think I will be okay getting here or should I not even plan on coming now? Dear wonderful Eric who can foresee the future. My hubby is in Greenwood Forest. A suburban is picking him up at 745am this Sunday to take him to IAH to catch an AA flight to Miami at 11am so we can go on our anniversary cruise. I’m flying to Miami from DCA. Do you think he will make it to airport and AA flight will fly or will I be celebrating our 40th on the Ship ordering champagne for one only??? Hi, we have flights out of IAH Saturday morning (return Sunday evening) to Memphis….we live out on 290 off Barker Cypress. Should we cancel flights? Can we get to airport? Right now the flights are all showing “high alert” and allowing refunds…. Any guidance would be helpful! Does it re-entering the Gulf and staying slightly offshore mitigate the rainfall for non-coastal counties around Houston? Hi Eric, I live in the Katy area and I am not from Texas. Meaning, I have no idea how to prepare for a hurricane of this magnitude (other than food and water, flashlights, batteries, medkits etc.,) Should I board up my windows as well?